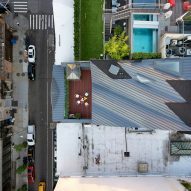 US studio WORKac has renovated a 19th-century structure in New York and added a spacious penthouse topped with a folded metal roof. 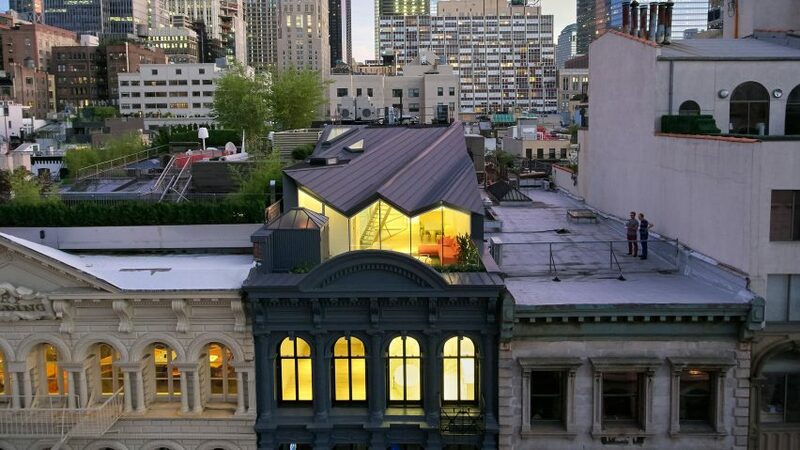 Called the Stealth Building, the project entailed the renovation of a historic building with a cast-iron facade, along with the construction of a new penthouse volume with a folded metal roof. It is located near a highly visible corner in the Tribeca neighbourhood. 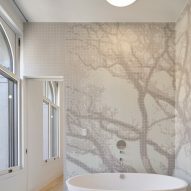 The residential project "required a careful approach to the blending of contemporary architecture with historic preservation", said WORKac, a New York-based studio founded in 2003. 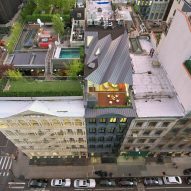 The city's Landmarks Commission stipulated that the rooftop addition be invisible from the street. It was a difficult requirement to address, given that the building faces a low-rise structure, enabling clear views from several blocks away. 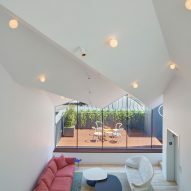 In response, the firm conceived a sloped, sculptural roof that minimises the addition's visual presence. Sightlines to the extension are blocked by the building's circular pediment and an old elevator bulkhead, along with a triangular pediment on a neighbouring structure. The facade of the building, completed in 1857, was fully restored. 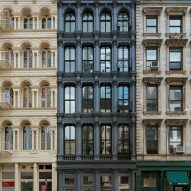 The new charcoal colour references the original hue of the building, which was painted dark to contrast with its lighter neighbours. 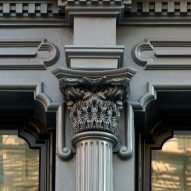 Given that the building's Corinthian column capitals had long been destroyed, WORKac collaborated with the Zurich-based architect and programmer Michael Hansmeyer to create modern renditions made of glass-fibre-reinforced concrete. Hansmeyer devised a computer script that produced fractal-style floral elements that mimic the proportions of the original capitals. "These capitals at first glance appear quite ordinary," said the designers. "It is only upon closer inspection that the stealth strategy of strategic injection of contemporary design becomes clear." 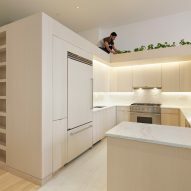 Inside the 14,000-square-foot building (1,300 square metres), the firm created spaces imbued with natural elements and forward-thinking ideas about urban living. 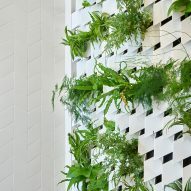 A tessellated green wall was installed in the lobby, and generous planters were added to several floors. Balconies provide connections to the outdoors. 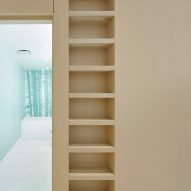 Within each apartment, the firm created a freestanding wooden volume that contains a kitchen, bathroom and storage area. Up above is a seating nook and fern garden. 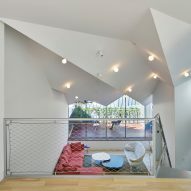 The penthouse – which totals 3,400 square feet (315 square metres) – has three storeys, all connected by an open staircase with mesh railings. Bedrooms and a family room were placed on the first level, while entertaining, cooking and dining areas are located the second level. The top storey contains a loft space. 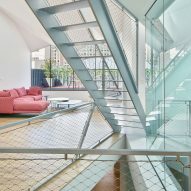 A sunken terrace and rear mezzanine provide views of Lower Manhattan, including the historic Woolworth Building and One World Trade Center. 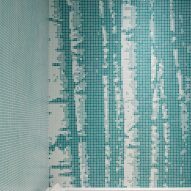 The elevator bulkhead was repurposed as a hot tub. 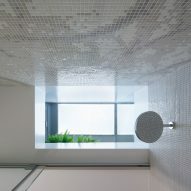 Other residential projects in New York include a luxury apartment building by Dutch designer Piet Boon and a micro-apartment tower by nArchitects that is meant to offer a solution to the city's affordable housing shortage.